Are you familiar with your cat’s vital signs? 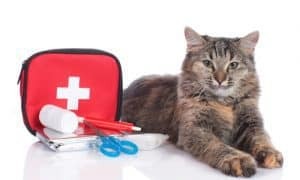 The time to learn how to take your cat’s vital signs is now — before you’re faced with an emergency! It’s very helpful for a pet parent to be familiar with your cat’s heart rate, respiratory rate, and temperature in case of an emergency. Learning how and periodically checking your fur friend’s vital signs is useful, not only for the practice, but you’ll also have a baseline of what is “normal” for your cat. 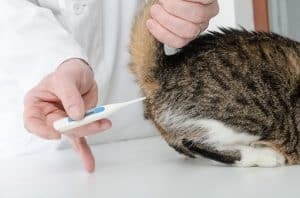 Taking your pet’s rectal temperature is the most accurate way to know if your pet has a fever or hypothermia. For detailed instructions on taking a cat’s temperature, click here. It is a misconception that you can tell if your cat or dog has a fever by feeling if its nose is warm. An animal might have a cool nose and a burning fever at the same time! Warm ears, however, can be an indication of fever and cold ears might indicate hypothermia. To measure your pet’s respiratory rate, count the number of times your pet’s chest rises and then falls. Count over a period of 15 seconds and then multiply by four. Respiratory rate is measured in breaths per minute. For cats, a normal rate is 20-30 breaths per minute. A panting cat’s respiratory rate can be as high as 300! Cats don’t normally pant unless they are stressed, frightened, or hot. They should not pant for more than a few minutes at a time. 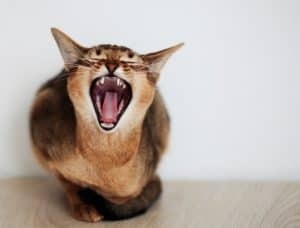 If you notice your cat panting for longer than that, treat it as an emergency. For dogs, a normal rate is 10-30 breaths per minute and 15-40 in puppies and toy breeds. A panting dog will take as many as 200 breaths per minute! What is abnormal? If you notice your pet’s abdomen expanding with each breath instead of his/her chest, that is not normal and you should seek veterinary care. Also, seek your vet’s help if your cat or dog has an abnormally slow or fast respiratory rate, makes gasping sounds, has shallow breathing, or is breathing with his/her mouth wide open. Normal heart sound will consist of 2 separate beats with a silent interval between them, and a regular rhythm, like a drum. If you have any doubt about your pet’s heart or you notice heart rate is not normal, treat this as an emergency. You can measure heart rate by locating your cat or dog’s femoral artery on the inner thigh. Bright pink gums are an indication of good circulation and oxygenation. 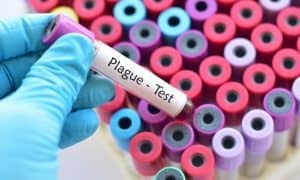 If your pet has dark red, gray, blue or white gums, that is an indication of a problem and can sometimes be very serious. Lift your pet’s upper lip and take note of the color of the inner lip and gums. A healthy pet will have a pink color to their gums. Brick red, brown, pale pink, white, yellow, or blue is an indication of an emergency like shock, blood loss, or anemia. That said, some dog breeds have dark pigmentation on their lips and gums which makes observation difficult and misleading. If your pet has naturally dark gums, you can gently pull down on the skin under the eye and observe the color of the inner eyelids. If your cat or dog has been sick with vomiting or diarrhea, dehydration can very easily occur. To see if your pet is properly hydrated, gently grasp the skin between the shoulder blades, pull up, and release it. It should “bounce back” almost immediately. If the skin takes more than 2 seconds to return or if the skin stays up in the position you grabbed it, that’s a sign of dehydration. Dehydrated pets need veterinary attention. 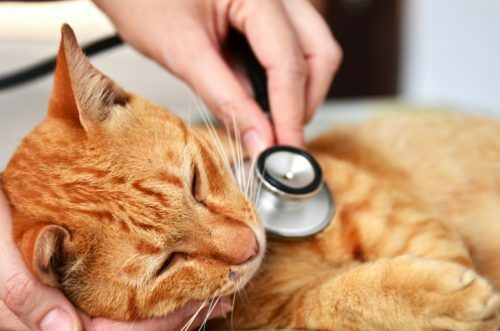 Familiarizing yourself with your cat’s vital signs – and knowing what’s normal for him or her now – will help you to quickly assess your furriest friend in the event of sickness or an emergency and relay that helpful information to your veterinarian. 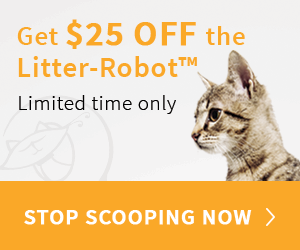 Knowing it could save your cat’s life!